Maxstor is engaged in steel locker manufacturing right from inception, storage locker is use everywhere for eg. School, Gym, Factory, recreation clubs etc. 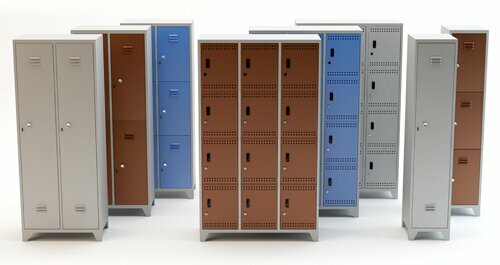 We can provide assistance in finding suitable lockers for Schools, lockers for Gym, lockers for Government departments, Team Lockers, PE Lockers, and Lockers for Health Clubs, Storage Lockers, Clothes Lockers, Country Clubs and Industry. Being a Storage Locker manufacturer and exporter our lockers are designed for complete solution to all your storage problems. 20 / 18 / 16 gauge full height door with stiffener and heavy duty hinge are used. All industrial lockers and garment lockers are with ventilation louvers located at top and bottom of the door to ensure permanent circulation of air in the locker. Being one of the leading storage locker manufacture in India, we are also known for customized storage locker exporter in India. We offer wide range of storage locker such as steel locker, garment locker, industrial lockers and workmen’s storage lockers. Robust and Rigid steel structure, wide locker variants. Separate frame alternatively with feet, base, or bench. Overall body made up of steel. Ventilation louvers for air circulations. Practical interior fittings and other accessories option available.